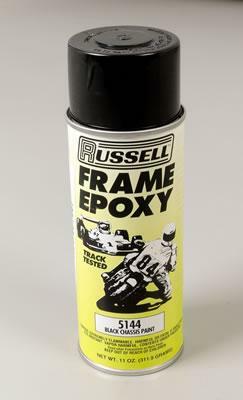 Russell Frame Epoxy Paint - Dezod Motorsports Inc - Home of the automotive performance enthusiast since 2002. Russell Frame Epoxy Paint uses high-quality pigments for intense coloration. It’s mixed from a modified formula aimed at producing the same sort of high-gloss finish that you’d get from a custom chassis painter. As it dries, this paint chemically hardens to produce a finish that is highly resistant to both fuel discoloration and chipping.